National Wool Museum0300 111 2 333work MuseumThe National Wool Museum displays tell the story of the Woollen Industry through working machinery, archive material, and exciting hands-on displays and textile gallery. Wool was historically the most important and widespread of Wales's industries and the National Wool Museum is housed in the historic former Cambrian Mills which made shirts and shawls, blankets and bedcovers, woollen stockings and socks sold throughout the world. The picturesque village of Dre-fach Felindre in the beautiful Teifi valley was once the centre of the thriving woollen industry, earning the nickname 'The Huddersfield of Wales'. 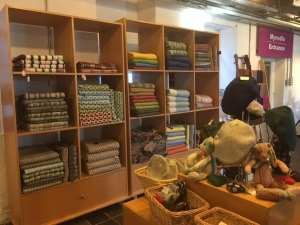 On your visit to the museum which holds the National Textile Collection, you can follow the process from Fleece to Fabric and visit the sympathetically restored listed mill buildings. The Museum houses a wide variety of historic machinery used in the woollen mills of Wales including the electric powered Willower - the ‘willy’ or ‘devil’ - is used to disentangle wool with its large revolving drum, covered with rows of iron spikes, opening up the wool in preparation for carding. The Carding Engine was invented in the 18th century. The carding engines comb the wool after it has been willowed, preparing the fibres for spinning. Cambrian Mills had four carding engines, 20 meters long and weighing 10 tons each. They were vital for mass production, because poorly carded wool would keep breaking when spun, wasting time and money, and reducing the quality of both the yarn and cloth woven from it. A raised walkway gives a unique view of textiles in production at Melin Teifi, the site's commercial woollen mill, while the Textile Gallery displays aspects of the National Flat Textile Collection. The National Wool Museum has excellent visitor facilities and a café and shop and not only tells the fascinating story of the wool industry in Wales but also supports the production of fabrics in traditional Welsh patterns by a working mill, which can be seen in operation within the museum. Open public holidays excluding Christmas and New Year.